Ypres in 1916 was possibly the most horrible place on the planet. Bang in the middle of a salient sticking out into the German line of trenches, this ancient Belgian town was an easy target for heavy artillery; most of its buildings had been reduced to rubble by constant bombardment. The British held the city despite the German assaults, and some officers of the Sherwood Foresters found an old printing press in a cellar beneath the rubble of the town ramparts. They decided to produce a magazine for the amusement of themselves and their comrades-in-arms. The first edition of The Wipers Times numbered a hundred copies, and the second proudly declared that all had been sold. The original press was destroyed by a shell, but the men acquired another and further issues appeared throughout the war, though the name changed as they took their printing equipment with them from one battlefield to another. It became The New Church Times at Nouvelle Eglise, then The Kemmel Times and so on, till in November 1918 the final issue was joyfully titled The Better Times. The content mostly focused on the experience of the British army. There is light verse, for example (A sample: ‘The world wasn’t made in a day,/And Eve didn’t ride on a bus,/But most of the world’s in a sandbag/The rest of it’s plastered on us’). A six-inch tolls the knell of parting day. The transport cart winds slowly o’er the lea. And leaves the world to Wipers and to me. At last we were in among the Huns. They were round us in millions and in millions they died. Every wag of our creature’s tail threw a bomb with deadly precision, and the mad muddled murderers melted. [….] Our creature then became in festive mood an, jumping two villages, came to rest in a crump-hole. Has your boy a mechanical turn of mind? Yes! The tone of the magazine is resolutely cheerful and upbeat, but the fact that most of it is parody allows readers to interpret this cheerfulness as sardonically as they wish. 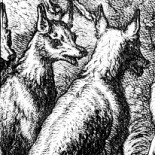 Like the facetious chat that was a common form of discourse among soldiers, these parodies assume a bond of shared attitudes uniting writers and readers. War is implicitly presented as an awful job that has to be done – and there is a tough-minded mockery of the politics of pacifism at home, with a parody advertisement urging readers to ‘Join General Haig’s great Peace March to Berlin’. The first issue contains a disingenuous note to the effect that ‘the shadow of censorship enveloping us causes us to refer to the war, which we hear is taking place in Europe, in a cautious manner’, but these magazines do not need to dwell on horrors. When articles hint at grievances, it is usually the short supply of whisky that is bemoaned; there are occasional digs at staff officers who showed themselves out of touch with conditions on the front line. Surrounded by twenty-nine Germans, Clarence was putting up a magnificent fight, but at the critical moment his sword broke, and there seemed nothing for it but surrender when a flying figure appeared on the scene. Plying his awful weapon with deadly accuracy, Willie had soon hacked his way to Clarence, and shouting ‘Follow me!’ dashed after the flying enemy. On every page of these magazines there is a sense of fun that triumphs over the grimmest of conditions. Its best expression is through the parodies that manage to express some of the complexity of the soldiers’ feelings about those at home. There is a soldier’s superiority towards those who have little idea of what war is like, of course, but, by constantly referring back to the comforts and safety of civilian life, the writers also acknowledge their readers’ nostalgia for more peaceful days. 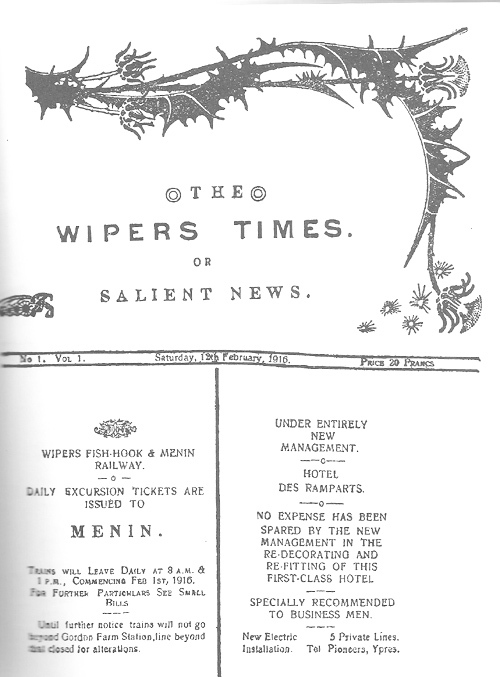 Facsimile versions of the The Wipers Times are available for sale here and here. George Simmers is a retired teacher and recently took a doctorate at Oxford Brookes University. He blogs at Great War Fiction. Fascinating stuff – thanks George. I vaguely knew about this before, but not in any great detail, and found it utterly rivetting. I’ve never doubted the power of humour as a weapon – both offensive and defensive – and gallows humour is ‘humour as a form of self defence’ writ large of course … but to maintain it to that standard, in those circumstances, hauling a printing press around the battlefields with you, just defies belief. It’s funny and inspiring and humbling all at the same time. This makes them seem more human somehow than more profound language would. Yes, it’s the printing presses that get me, and getting hold of paper the right size, and the ink … amazing work in a bombed-out city. This is a wonderful discovery for me. Such a moving story. It is yet another insight into the unimaginable resilience of those who fought in the Great War. The nonchlance of the humour and irony in those terrible conditions is hard to credit … But there it is. Deeply grateful to George Simmers for telling me all about it. This entry was posted on October 11, 2012 by Guest in Non-fiction: current affairs, Non-fiction: history, Non-fiction: Humour.